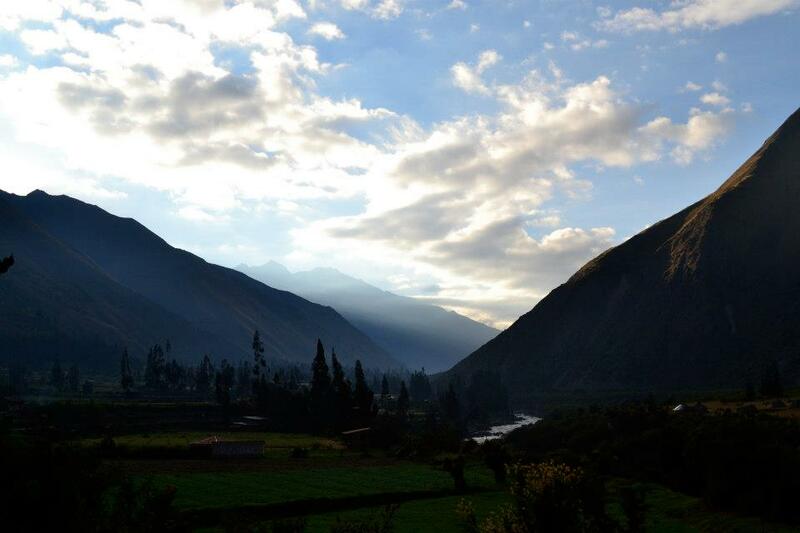 Our Inca Trail adventure began with an early morning wakeup and a 4:00am rendezvous with our trail guide, Edgar, in the hotel lobby. He led us down to the intersection of two main roads in old town Cusco, where we awaited the arrival of our bus, huddling close to keep warm in the chilly morning air. Thankfully the two-hour bus ride to the starting point provided time for some extra shut-eye, which was welcome knowing what lay ahead. A couple of hours later, with the sun just beginning to show itself, we sat down to a lovely breakfast of scrambled eggs, toast and tea prepared by the porters and had our first interaction with the rest of our hiking group. We were nine in total, all in our late 20s/early 30s, and everyone seemed pleasant and friendly — a good group to hike with. 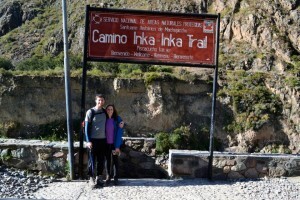 The trek began with a short, flat leg that took us to the start of the trail, which is located at a spot called Km 82, named for its location on the railway between Cusco and Machu Picchu. The group inched through a checkpoint where our permits and passports were inspected and stamped, and then we were on our way! We would hike for five hours or so before lunch, passing the first of many ruins visible from the trail. 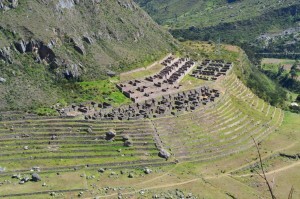 The site, called Patallacta, was located in the valley, and we gazed down upon it from our resting point on the trail. 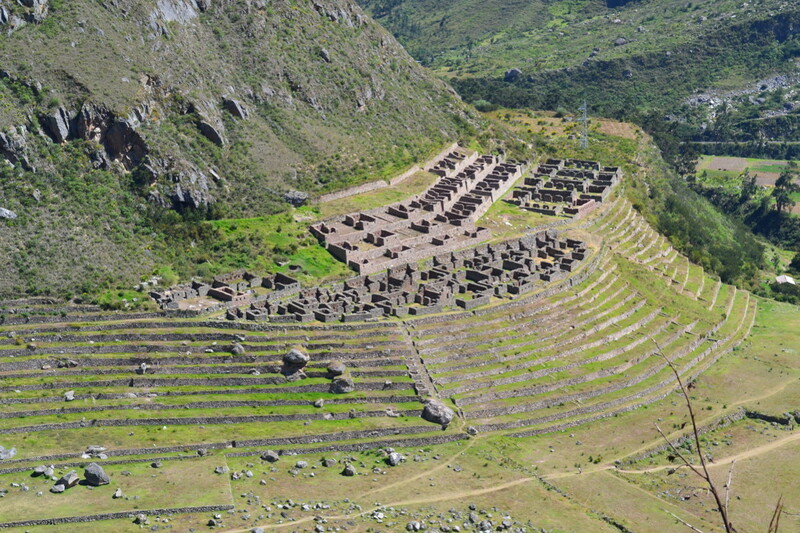 Edgar was full of knowledge about the Incas and how they lived, and he informed us that they had spaced out their settlements so that inhabitants of one could communicate with those in the next, a system which allowed messages to be more easily sent along the trail, all the way to Machu Picchu. The incline during this first stint was manageable, and we had frequent water breaks, but we were still happy to stop for lunch — the opportunity to drop our daypacks and take off our boots for a while was welcome. The food prep, presentation and quality was impressive from meal one. While we made our way up the trail slowly and methodically, our porters seemed to fly passed us, loaded down not only with some of our overnight bags, but also with all the cooking equipment and food needed for the four days of meals on the trail. And what they prepared was not simple. Every meal aside from breakfast came with a soup course, a main meat plate and numerous sides that were passed around the table, which, by the way, was set up inside a dining tent and also transported up the trail on the porters’ backs. Each meal was truly an amazing feat – elaborate and delicious in any setting and incredibly impressive given the conditions. After enjoying the first of such meals on our lunch break, the group packed up and prepared for leg two of the first day of hiking. We were in for what would prove to be the most difficult stretch of the trail – nearly four hours of hiking up, over steep terrain and long stretches of challenging stone staircases. It was slow-going at times and required many breaks. 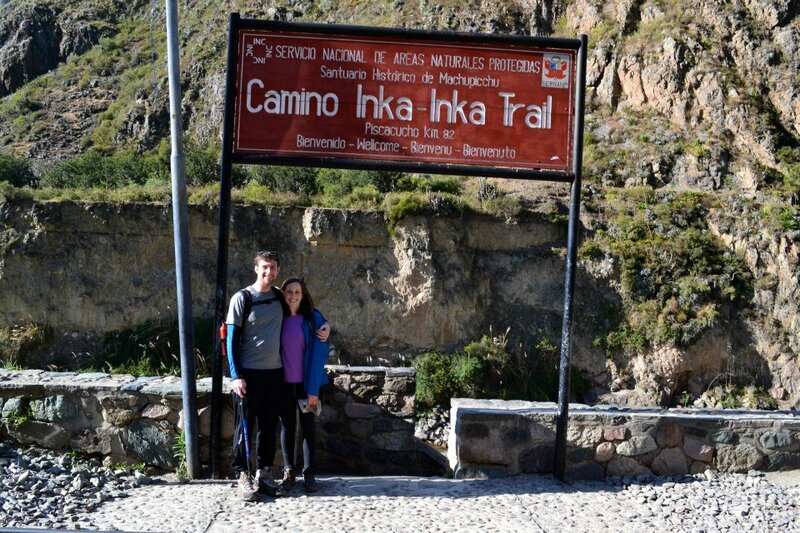 Enigma, our tour group, kept a slightly different schedule than the traditional Inca Trail trek groups, and our first day of hiking totaled approximately 11 miles. This set us up for a day two start ahead of most other hikers, but it made day one of the trek quite demanding. I was thankful to arrive at camp that evening, shortly before dusk. 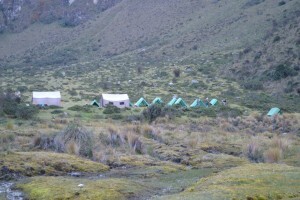 The porters had already been there for some time and had set up sleeping tents for the group as well as a dining tent where we all convened for dinner. Despite initial concerns about not having shower access for four days of sweaty hiking, I found I was quite satisfied with the towel and warm bowl of water that the porters brought to our tents each evening. I’d also brought along body wipes that I’d gotten at EMS, which I highly recommend. After cleaning up we met in the dining room for some popcorn, tea and conversation with the group. Dinner followed shortly after and was another lovely meal, complete with soup course and dessert. Around 8:00pm, people began to retreat to their respective tents. It had been a long, grueling day, and the sun had been down for a good two hours at this point, which made bed even more inviting. 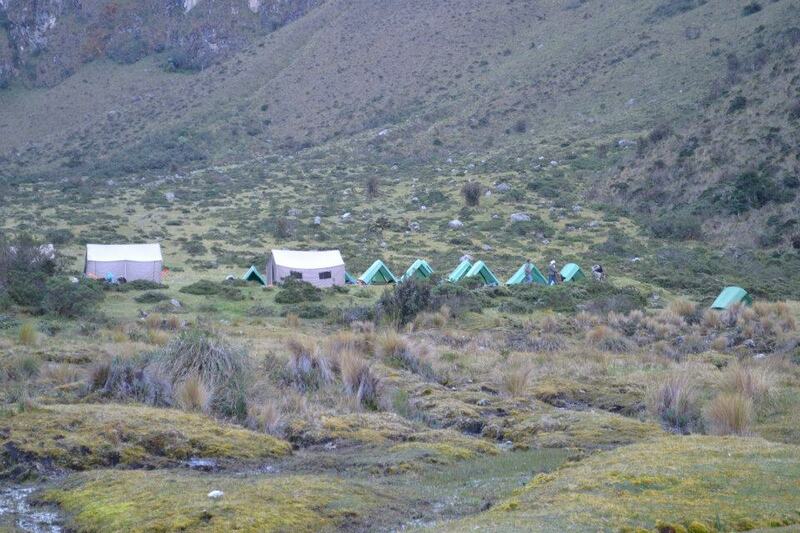 We were also camping at high altitude and the air was chilly, so we looked forward to crawling into our sleeping bags. Danny took a few pictures of the night sky and I recorded the day’s events in my journal. Falling asleep before 9:00pm was no problem.